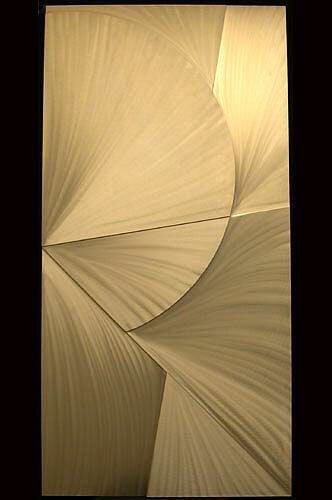 A rectangular welded and polished aluminum bas-relief. Triangles and arcing triangles are joined in multiple levels of relief. It is signed on the reverse side: "Laddie John Dill 2000". Laddie John Dill, twice awarded the National Endowment for the Arts, Artist's Fellowship, as well as the John Simon Guggenheim Fellowship, has works in over 26 major museum collections, internationally. Beginning with his first and fifth one man shows at the Sonnabend Gallery in New York in 1971 & 1972, he has had an illustrious career with his signature mixed media works of cement, glass, and natural oxide pigments on wood foundation, as well as his monumental metal sculptures in public and private locations around the world. This aluminum work represents a newer medium for Mr. Dill.